Fir was designed to supply Lighthouses with fresh water, and other necessities. She has a capacity to store 23,528 gallons of potable water. This particular feature makes her ideally suited for providing humanitarian aid. Unfortunately, a current lack of filtration and RO systems makes Fir completely dependent upon loading water from a dock. We will have to make significant changes and add new systems in order to support our intents and purposes. The following diagram from 1981 illustrates the present potable water system. 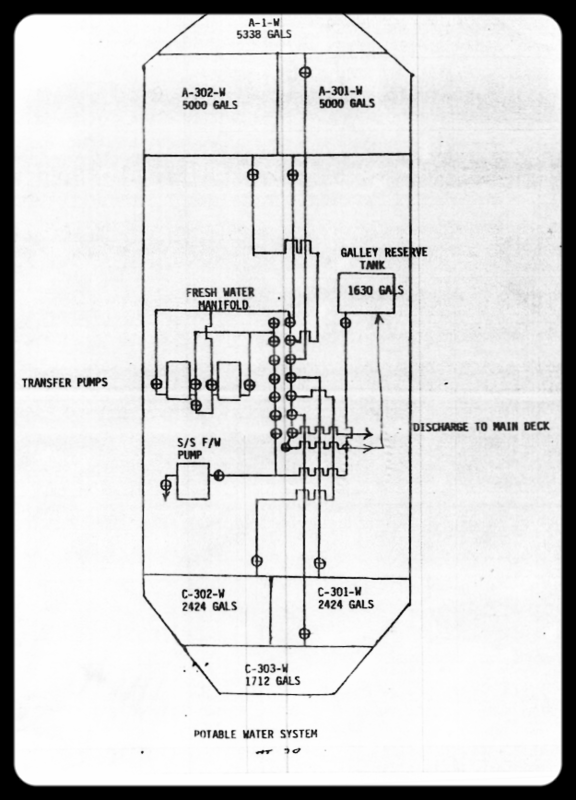 A March, 1981 diagram of Fir's fresh water system. Our proposed use requires independence from terrestrial sources. In the end, we need the ability to make potable water from 1) sea water, 2) natural fresh water, and 3) municipal water (that may not be terribly clean), The diagram below indicates our general view of the system. During this process, we will retain a water consultant that can develop the specifications for our system. In the end, we hope to build or have built a fresh water system mounted to a frame so that it may be installed as a unit. FIrst and foremost, we need to have a spare parts package for the system. There must be a substantial supply of consumables, like cartridges, and biocide along with the most obvious spare parts from controllers to O-rings. To the extent possible, we want to spec pipes, hoses, and fitting that we utilize elsewhere on the boat. This will be an important part of our work with the consultant. Our plan to produce and manage fresh water.